Many thanks to those of you who were kind enough to mention the 100wc.net site which is the children’s version of this challenge. Let’s hope we get more folks commenting on their fabulous work! Now for this week. There have been songs written about them; poets have poured out their creative juices for them; we organise our lives around them. I’m talking about days of the week. I personally do not like Mondays (cue song ‘Boom town Rats’!) I really like Thursdays I think mainly because they are so near to a Friday. When I was teaching it was the middle of the week that was always odd. If the children were going to be unsettled or the weather bad or a disaster were to happen it was often THAT day. So the prompt for this week is: ….WEDNESDAY…. Click here to enter the URL of your post. It will take you to another page but I will come back and link it here as soon as possible. It will close at midnight on Monday 6th Feb. Please put a link / mention back to this blog so that folks can read all the other entries. Do go and read each other’s. That’s where the great ideas come from! But it’s Wednesday! Isn’t it? Wednesday – Susan Writes Precise. Just posted my first ever 100 word challenge (#43) and love the idea and the range of stories and ideas that everyone has come up with. Looking forward to next week! LimebirdBeth and LimebirdKate’s offering is now up! 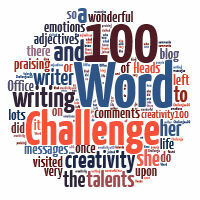 – http://limebirduk.wordpress.com/2012/02/03/100-word-challenge-wednesday/ 🙂 Have added it to the links. I thought I wasn’t getting the emails from you but I did get the last two…I did a search…first one came up empty, but using this one when it just came in I found that I must have been confused…Me?…sigh. Was off line when having problems, that may have caused a blip to think I’d gone away. Anyway…problem solved. Just don’t know how to do the instructions for the badge…but will follow with interest and write on my own. This old lady is just taking too long to figure all this out…but will eventually ☺. I entered one. It showed up. But doesn’t now appear on the list above. Pingback: Wednesday Weeks « Does writing excuse watching? A nice simple one this week – thanks. I managed to get in quick this week. It’s my second time, but I’m loving this! Thanks Julia. I gotta ask, where do you get the prompts? I’m not sure how I was supposed to link this – it kept telling me the link was closed for Topic #28, so I thought I would just put it in the comments since this is my first attempt. “You bought her what for her birthday?” Samantha’s eyes looked like they would pop out of her skull as she confronted Kelvin. Hope you got my message on your blog! I can’t find it unless it’s the one about if I’m going to miss the deadline? I have written my entry for this week’s prompt of “Wednesday”, just have to figure out how to link it. Thanks for checking up on me, this is all so new. @benzeknees Go to the top of the post and read the last paragraph. the one right before the current list of entries. The first two words “Click here” are for entry in this week’s challenge. I haven’t tried the link on Week 28’s challenge again. Is it now locked? It probably is because the challenge has moved on to Week 29 now.